December 13, 2012 -- Terry Bell Writes, posted at Links International Journal of Socialist Renewal with permission -- The tortuous road to the governing African National Congress' (ANC) centennial conference at Mangaung ends next week. And, not to put too fine a point on it, much of the country is gatvol [fed up] with the route it has taken and where it has arrived. Potholed with corruption, meandering in no fixed direction to the profit of cronies, and riddled with damaging scandal, it should long ago have been resurfaced, rebuilt and given a clear destination. But it has remained in place as a national project and, in the process, has pushed into the background the ongoing — and often more subtle — unethical dealings outside of government circles. In recent years and despite occasional grumbles, the country’s major trade union federation, the congress of South African Trade Union (COSATU), has continued to stumble along that road, praising its supposed promise. The federation was committed to it, especially after declaring, at its congress in 2006, that a “Zuma tsunami” would cure the ills on the road ahead. In the event, the leapfrogghing into power of President Jacob Zuma has proved even more destructive. December 5, 2012 – Links International Journal of Socialist Renewal -- The December 3-6, 2012, World Toilet Summit offers an opportunity to contemplate how we curate our crap. Increasingly the calculus seems to be cash, generating contradictions ranging from local to global scales, across race, gender, generation and geography. Nowhere are they more evident than in the host city, my hometown of Durban. We’ve suffered an 18-year era of neoliberal-nationalist malgovernance including toilet apartheid, in the wake of more than 150 years of colonialism and straight racial-apartheid. 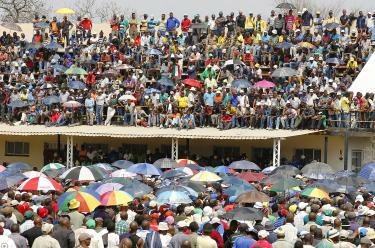 Thousands of Amplats mineworkers rally in Rustenburg, South Africa. November 12, 2012 -- International Labour Research and Information Group -- Over the November 10-11, 2012, weekend striking mineworkers of the Anglo American Platinum (Amplats) corporation gathered at a mass rally in Rustenburg and howled their defiance of a series of ultimatums issued by the company. At De Doorns, farm workers are on a "wildcat" strike -- the latest of a series that has become a feature of the South African landscape over the last three months, knocking the African National Congress conference in Mangaung off the front pages. Something is stirring from below … and it is time we got beyond the fear and trepidation that have become the stock response in the media. South Africa: What has Hurricane Sandy taught the ruling elite? Storm surge from the cyclone in Durban, March 2007. November 6, 2012 – Links International Journal of Socialist Renewal -- What did Hurricane Sandy teach us in South Africa, just as $30 billion of state funds are being committed to the dig out of vast new Durban port capacity over the next three decades, plus billions more nearby for petro-chemical industry expansion in Africa’s largest oil-refining complex? Not much, judging by the dunces I’ve met during the Environmental Impact Assessment (EIA) process, which on October 31 included an Open Day for discussion sponsored by the biggest investor, the state-owned Transnet port and railroad operator. Africa’s largest harbour, Durban is facing stiff competition: from Maputo in Mozambique for shipments to the huge Johannesburg market; and from other ports along the coast attempting to set up regional freight hubs and export processing zones. Transnet and Durban municipal officials are reacting like clumsy dinosaurs. SACP's Blade Nzimande leads COSATU members prior to clashes with striking Anglo Platinum miners. October 27, 2012, Rustenburg, North West. Photo by Greg Marinovich, Daily Maverick. October 29, 2012 -- The Democratic Left Front condemns the police for shooting workers in Rustenburg on October 27. Two workers who work at Amplats were hit by live ammunition, and one, hit in the chest, is in a critical condition in hospital. Eleven other mineworkers were injured by rubber bullets. The DLF also condemns Blade Nzimande, SACP general secretary and minister for higher education, for condoning this shooting by the police. This so-called “Communist” defends the shooting of workers in the interests of the capitalist bosses. Marikana miners protest against the August 16, 2012, massacre by police. October 18, 2012 – Links International Journal of Socialist Renewal -- When a ruling party in any African country sinks to the depths of allowing its police force to serve white-dominated multinational capital by killing dozens of black workers so as to end a brief strike, as happened in South Africa in August, it represents not just human rights and labour relations travesties. The incident offers the potential for a deep political rethink. But that can only happen if the society openly confronts the chilling lessons learned in the process about the moral degeneration of a liberation movement that the world had supported for decades. Support was near universal from progressives of all political hues, because that movement, the African National Congress (ANC), promised to rid this land not only of formal apartheid but of all unfair racial inequality and indeed class and gender exploitation as well. And now the ANC seems to be making many things worse. September 20, 2012 -- Amandla! -- A heroic struggle has tasted its first victory. The reported wage settlement with the mineworkers at Lonmin's Marikana platinum mine -- site of the terrible August 16 massacre of workers by police -- of R11, 000 is a massive victory, nothing less than the murder and sacrifice of so many workers dictated. With an unholy alliance of Lonmin bosses, the bosses of the entire platinum sector, the army, police, government and even the leadership of the South African Communist Party and the pro-government National Union of Mineworkers rangeed against them, Lonmin workers can turn from their wage struggle to the struggle for justice with enormous pride and their dignity restored. This struggle has already rewritten the history of the international labour movement. In the eyes of the world, Marikana is not a place but an expression that workers' struggle -- class struggle -- is not yesterday's language and ideology, but lives in the struggles of the exploited and oppressed from below who continue to fight the good fight. The Democratic Left Front's Vishwas Satgar interviewed on the Real News Network, August 31, 2012. Transcript below DLF statement. More at The Real News. STOP PRESS, September 2, 2012 -- Following national and international outrage, South African prosecutors have provisionally dropped murder charges against 270 miners whose 34 colleagues were massacred by police. Acting national director of prosecutions for the National Prosecuting Authority (NPA) Nomgcobo Jiba said that after having sought an explanation from the department's lead prosecutors, she had taken the decision to review the charge. A final decision would be taken on the charges after a series of investigations into the shootings had delivered their findings. The workers have been held in custody since they were arrested on the day of the shooting -- August 16 -- at Lonmin's mine in Marikana, northwest of Johannesburg. Courts will start releasing them after police verify their addresses. The first batch of at least 140 miners is due to be freed on September 3 while the rest should go home on September 6. August 30, 2012 -- Links International Journal of Socialist Renewal publishes a number of tributes to Neville Alexander, a great South African revolutionary, who died on August 27, 2012. Following the tributes is an extensive biographical essay by the South African History Online project. August 29, 2012 -- Comrades and friends who have known Neville Alexander through the Workers Organisation for Socialist Action mourn the passing of this great socialist and revolutionary. Neville Alexander dedicated his life to the struggle against oppression and injustice and for the upliftment of his fellow human beings. From the early days of student struggles to his arrest and imprisonment on Robben Island to his latter years working on language and education, Neville Alexander’s deep humanitarian spirit, his respect for the ordinary people and his humility were always present. South Africa: Marikana massacre – a turning point? Marikana mineworkers on strike for higher pay. For more coverage of South Africa, click HERE. 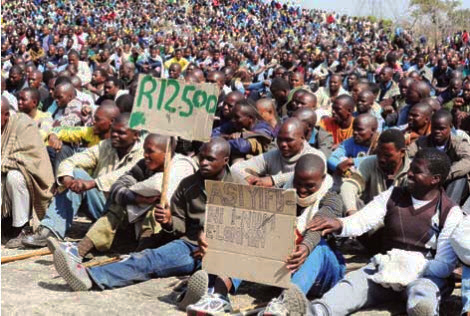 August 27, 2012 – Links International Journal of Socialist Renewal -- The massacre of 34, and almost certainly more, striking mineworkers at Marikana (together with more than 80 injured) on August 16 has sent waves of shock and anger across South Africa, rippling around the world. It could prove a decisive turning point in our country’s post-apartheid history. Marikana is a town situated in barren veld, dry brown grass in the winter, with occasional rocky outcrops (kopjes, hillocks). The Lonmin-owned mines – there are three, Karee, West and East Platinum – are situated on the outskirts of the town. Alongside two of them is a settlement of zinc-walled shacks festooned with lines of washing called Enkanini, where most of the mineworkers live. August 27, 2012 -- Terry Bell is a widely respected labour reporter and activist based in Cape Town, South Africa. His "Inside labour" columns in Amandla! magazine and on his blog, Terry Bell Writes, are essential reading for those interested in developments in South Africa's labour movement. Below, with Terry Bell's permission, Links International Journal of Socialist Renewal posts some of his recent columns dealing with Marikana massacre and the background to it. August 23, 2012 -- Terry Bell Writes -- The deaths at Lonmin amount to the bloodiest tragedy of the post-apartheid era. As a result, the blame game is in full swing and is likely to continue in the weeks ahead. July 2, 2012 -- The Democratic Left Front (DLF – South Africa) expresses its full solidarity with the women, workers, progressive mass movements and the SYRIZA party of Greece as they face the deep effects of the EU-inspired austerity onslaught. The Greek austerity plan involves cuts of 11.6 billion euros ($14.5 billion) by 2014. This amount will come from brutal cuts in budgets for health, wages and pensions. It will also mean hundrends of thousands of job losses in the Greek public sector. This austerity plan is meant to make the workers and the poor pay. South African workers and unemployed people have faced a similar onslaught for the last 18 years under neo-liberal African National Congress (ANC) rule. In the June 17 elections, the anti-austerity SYRIZA (Coalition of the Radical Left) came a close second with 26.9% of the vote. The right-wing New Democracy won the elections with more than 29%, amid huge blackmail and threats from major European governments and financial institutions. 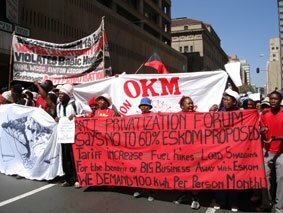 Operation Khanyisa Movement banners at a march in Johannesburg, 2008. April 5, 2012 -- Links International Journal of Socialist Renewal -- The following interview appears in the South African left magazine Amandla!. The latest issue has just been released. Click here for the full contents. The new issue of Amandla! features analysis of the African National Congress' centenary. 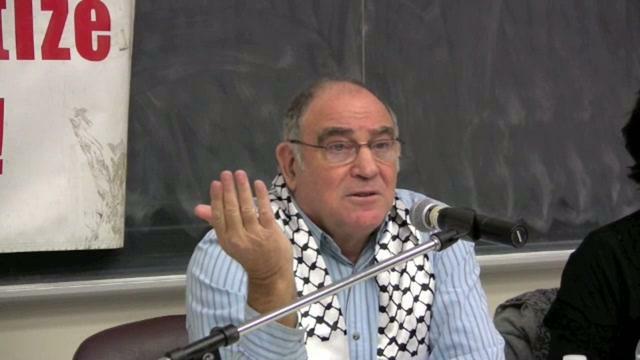 Ronnie Kasrils speaks out against Israel's apartheid policies, March 5, 2009. March 26, 2012 – Links International Journal of Socialist Renewal -- ‘I don’t have the stomach or the taste to serve any more at this level,’ said the normally ebullient minister of intelligence Ronnie Kasrils, as he quit after 14 years of service to the South African government. It was late September 2008, just after Thabo Mbeki was replaced in palace coup. Kasrils’ intelligence service was by then an international laughing stock, with spy-versus-spy intrigue spilling out wide across the political landscape. His own troops were locked in unending, ungovernable, internecine battles against each other’s factions, using hoax emails, other disinformation and extraordinary political contortions unknown in even the ugliest Stalinist traditions of the African National Congress (ANC). Recall that Mbeki’s police chief Jackie Selebi was also the head of Interpol, and to have the mafia penetrate such high levels made South African security farcical at best.